Whether you’re looking to assess new markets to enter, do competitive intelligence or grow your ROI by building on existing clients, MarketLine Advantage can help provide you with the insights and the contacts to make the right decisions. Advantage is MarketLine’s interactive platform, giving you any time access to a unique mix of company, industry, financial and country business data, for every major marketplace in the world. We profile over 30,000 companies operating in a range of industries and provide data on over 200+ industry sectors in various geographies. How can Advantage help you? MarketLine is a proprietary global market analysis provider, giving commercially relevant insights on hundreds of industry sectors globally, accompanied by SWOT analysis on thousands of companies operating in each industry sector at a regional or market specific level. 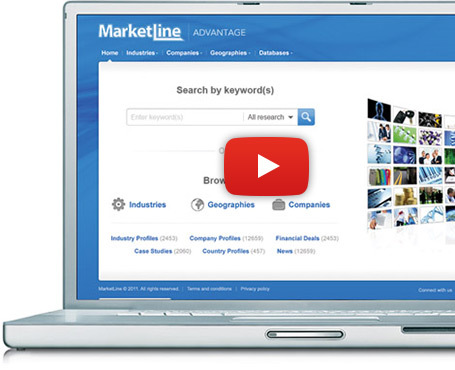 MarketLine is an Informa business. To see first hand the value of MarketLine content to you and your organization, request a trial of our Advantage service today.